Ah to be a 10 year old boy again! There is something very special about the 10 – 11 year old range for boys. They have grown enough to be able to learn to play sports with actually skill, to be able to understand the rules of the game, to be able to demonstrate good sportsmanship, and to have a heart big enough to care. At this age they are not yet permanently distracted by the female gender and raging hormones. The focus is on enjoying life and having fun. As my wife and I had the privilege of watching our son grow this past year, I was reminded anew of this special time in life. I think there is something that draws most men back to that time in their life. While we cannot go back in time, I do believe having fond memories of this period of your life are an extremely important foundation for the next (more challenging) stages of adolescence and young adulthood. I am extremely thankful and grateful to have had the opportunity to watch Rowan experience that and be a part of helping make it happen. 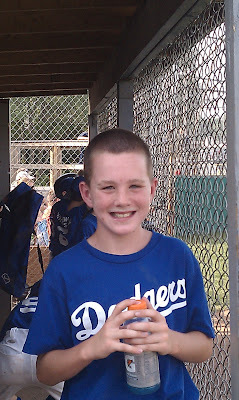 This past week was the end of the 2010 season for Naamans Little League. Rowan’s team made it into the playoffs and while they didn’t win, they did have a great last game as described in the write-up below. Thanks to team manager Rob Mullen and coaches Bo Pagleili and Gregg Donahue for the skills they taught the boys and for being such positive role models to them! The Phils jumped out to a 7-1 lead through three innings then had to hold on to withstand another Dodger rally to win 7-6 and advance to Saturday’s AAA Championship. The Phils got off to a fast start with three runs in the first courtesy of Jake Mottola’s 2 RBI double to the wall and Ryan Maffia’s steal of home. Two innings later Mottola tripled in Jake Steltz and George Steinhoff to put the Phils up 7-1. After three quiet innings, the Dodger bats came alive in the visitor’s 4th with 4 runs, with the key blow being Jeremy Hartnett’s monster 2 RBI triple to the wall in left center that pulled the Dodgers within 2 runs at 7-5 before the Phils escaped further damage. Down to their final three outs, the Dodgers mounted one last charge. With one out, Rowan Davis legged out an infield single and stole his way around the bases to pull the Dodgers within a run before Phillies’ pitcher Austin Leshock retired the side on a Mike Pagliei’s comebacker and a strikeout. Mottola led the Phils with 4 RBI and three hits, plus 7Ks on the mound. Ryan Maffia scored a pair of runs, and Matt Hetrick blasted a ground rule double to balance out the attack. Hartnett and Harry Geisenberger (2-3, double, 2 runs) led the Dodgers offense, and Tommy Donofrio pitched a pair of scoreless innings to keep the Dodgers in striking distance. Congratulations Rowan on a mighty fine season and I hope you will always look back on this year of your life and thank God for the fond memories!